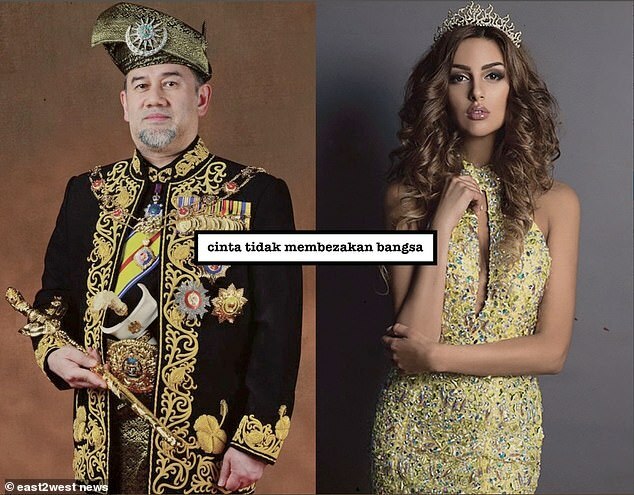 A former Russian beauty queen has become a real queen after marrying Malaysia’s King Muhammad V of Kelantan on Thursday, November 22. Oksana Voevodina, 25, converted to Islam in April before tying the knot to the 49-year-old Malaysian monarch. The couple’s luxurious wedding ceremony took place in Moscow, where alcohol was banned and only halal food was served. Oksana, who was crowned as Miss Moscow in 2015, has brains as well as beauty: she graduated from the prestigious Plekhanov Russian University of Economics. Her husband studied at Oxford University and later attended the European Business School in London. The new First Lady met her husband 18 months ago in Europe, while promoting elite watches, according to beauty contest director Tatiana Andreeva. “Oksana is a model. She worked a lot abroad, so an encounter of such a level is quite predictable,” she said. “She met Muhammad 18 months ago in Europe. Local media reported that upon returning to Malaysia, Oksana will be known as Rihana Oxana Gorbatenko.